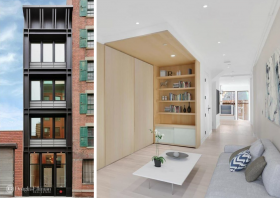 What this newly built townhouse lacks in width, it makes up for in height (h/t CityRealty). Located on one of the historic area’s original cobblestoned streets, at 246 Front Street, the 12-foot-wide home has four stories, plus a basement and private roof terrace. In addition to its narrow frame, the house also stands out for its unique metal facade, made entirely of steel and zinc.